Briarwood Lakes is an active adult community in Oak Brook, Illinois. This gated community offers resale homes in one of the most sought-after Chicago suburbs. Briarwood Lakes location in Oak Brook offers access to entertainment and is conveniently located near major roadways, which makes traveling a breeze. Briarwood Lakes is a 55+ community where residents share the same carefree lifestyles. It s easy for neighbors to turn into lifelong friends who share the same interests and hobbies. With scenic views and maintenance-free homes, Briarwood Lakes offers a convenient lifestyle for today s active adults. Briarwood Lakes is situated on 92 acres with homes built around scenic lakes and lush landscaping. The beautiful lakes that surround the community provide a setting that s quietly tucked away from crowded places, yet it is still easily accessible to nearby attractions. The first home in Briarwood Lakes was built in 1970 and the community was completed in 1985 with 199 attached homes. These homes were built in two styles, single-story ranch villas and traditional two-story townhomes. Active adults enjoy living in a low-maintenance home without having to give up size and privacy. Most residences within Briarwood Lakes offer between 2,100 to 3,000 square feet of living space with two to three bedrooms, two to three bathrooms, and an attached two-car garage. Residents of Briarwood Lakes enjoy the luxury of maintenance-free living within a private community. The community collects an association fee that includes common area insurance, security, cable and Internet. Homeowners never have to worry about tiresome home chores because the association also handles exterior maintenance, lawn care, and snow removal. 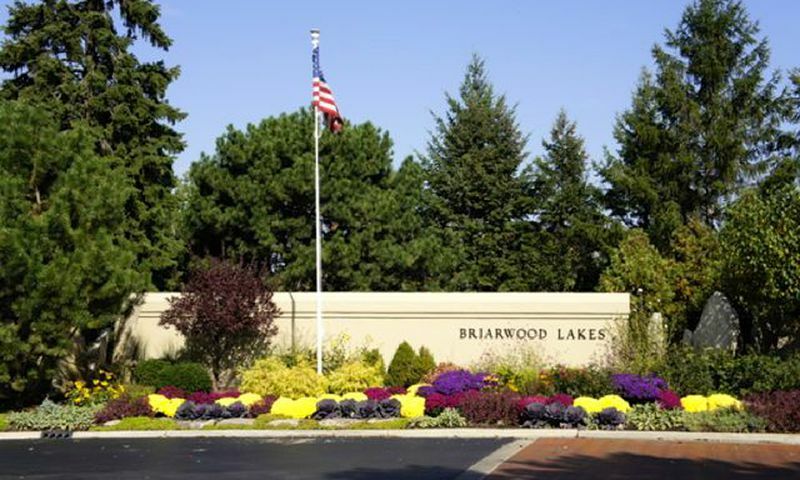 Briarwood Lakes is located in Oak Brook, Illinois just west of Kingery Highway and north of 31st Street. This active adult community is situated 20 miles west of downtown Chicago, making it less than a 30-minute drive to exciting attractions and big-city nightlife. Briarwood Lakes convenient location to major roadways like the Tri-State Tollway (I-294) and East-West Tollway (I-88) makes traveling to O Hare International Airport an easy 20-minute drive. Closer to home, Oak Brook offers plenty of shopping less than three miles away at Oakbrook Center, a luxurious shopping center. DuPage County offers plenty of recreational opportunities throughout the area. Golfers will enjoy living near Oak Meadows, Green Meadows, and Maple Meadows Golf Clubs. Briarwood Lakes is also situated next to Butler National Golf Club, an exclusive private golf club. With low-maintenance homes in an ideal location and neighbors who share the same interests, it s easy to see why active adults enjoy living in Briarwood Lakes. Check back soon for more information on the lifestyle in Briarwood Lakes. Briarwood Lakes encompasses 199 attached homes available on a resale basis. These homes were built in two styles, single-story ranch villas and traditional two-story townhomes. Active adults enjoy living in a low-maintenance home without having to give up size and privacy. Most residences within Briarwood Lakes offer between 2,100 to 3,000 square feet of living space with two to three bedrooms, two to three bathrooms, and an attached two-car garage. We really enjoy living here. The homes are a little older, but many have been recently updated and show nicely. Oakbrook is a fantastic area if you love shopping, eating out, parks and recreation. There is always something to do and the location of Briarwood Lakes is right in the middle of it all. Oakbrook is very well known as a really nice Chicago suburb and it's evident in the home prices here. You're paying for a great location as well as really nicely maintained homes. When we purchased a home here a few years ago every place we looked at we very well kept and that showed me the homeowners take great pride in their homes. Living in a really nice neighborhood where everyone takes good care of their homes was very important to us in our decision to buy here. 55places.com is not affiliated with the developer(s) or homeowners association of Briarwood Lakes. The information you submit is distributed to a 55places.com Partner Agent, who is a licensed real estate agent. The information regarding Briarwood Lakes has not been verified or approved by the developer or homeowners association. Please verify all information prior to purchasing. 55places.com is not responsible for any errors regarding the information displayed on this website.